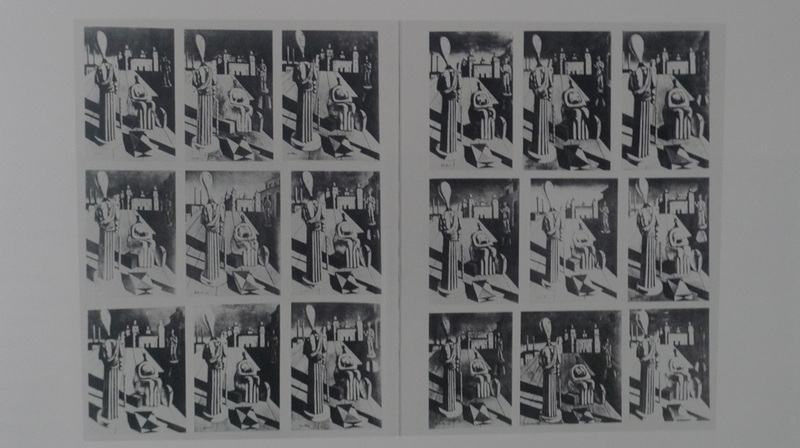 Hadn’t realised how much repetition was part of Georgio de Chirico’s work until I came across this image from art historian Carlo Ragghianti’s, Critica d’Arte 1979 magazine. The image was featured in a catalogue from a MOMA retrospective in the early 80s. 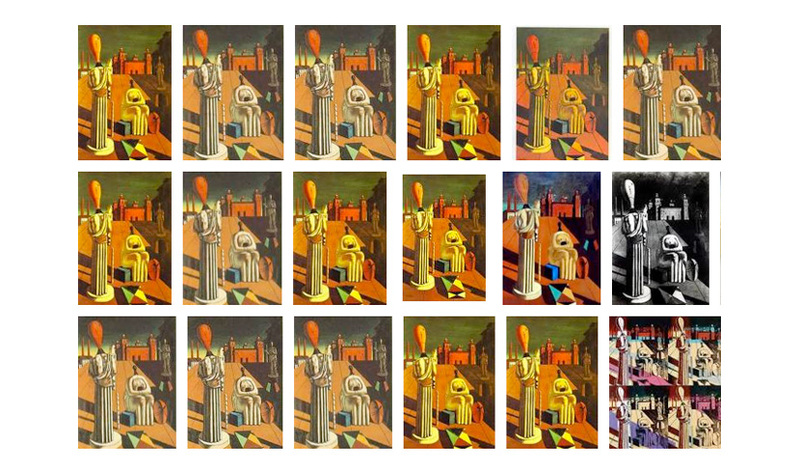 Critics of the show lambasted this repetition as a money making enterprise… but Italian art critic Achille Bonito Oliva believed “.. de Chirico viewed repetition as a way of expressing himself”. The image shows 18 versions of this painting from the years 1945-62. Apparently de Chirico used sheets of tracing paper bearing the initial imprint of basic configurations. So they are never exactly the same. Did a quick Google image search and came across over 100 images of The Disquieting Muses. On the screen they immediately reminded me of Carlo’s compilation. Particularly great to see one of Andy Warhol’s images – bottom right. Andy had seen the above image from the catalogue. No one really knows when the pair met. But there is no doubt that Warhol would have appreciated de Chirico’s serial approach to making painting. Wonder what they would think of this Google image?